There sometimes is a theoretical debate whether when leases expire, concession ends, do the land title or ownership hands back to the owner. Often the owner is government or another company that owns the land title deeds. 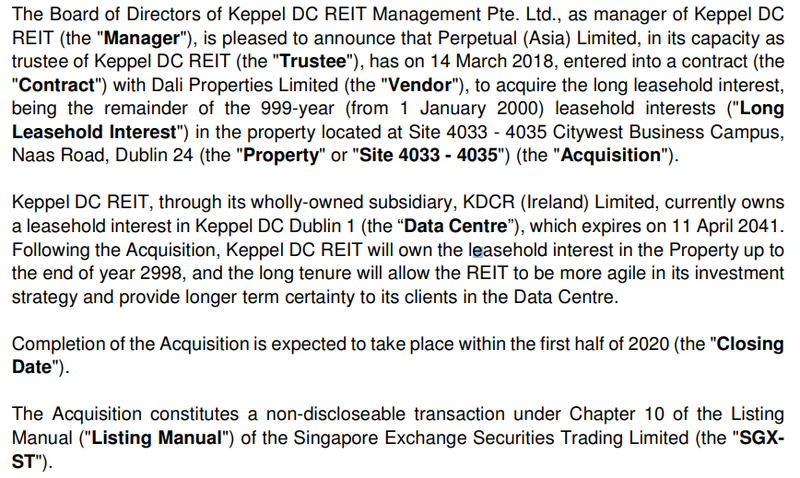 Yesterday Keppel DC REIT, one of Singapore’s unique REIT that focus on data center with long lease to tenants, acquired the rest of the 999 year lease of a data center they currently own in Dublin, Ireland. The total consideration was for 30 mil Euros or S$48 mil. Completion is expected to be in 2020. Keppel DC IPO in End 2014, so the land lease when IPO has only 27 year land lease left. 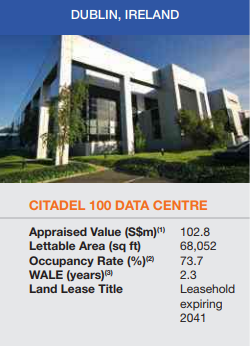 Keppel Dublin DC 1 was known as Citadel 100 Data Centre during IPO. The Appraised Value then was S$102 mil. In 2016 Annual Report, it report the occupancy to be 55.8%. The Appraised Value has fallen to $S81 mil. In the latest 2017 full year result, the occupancy stayed roughly the same the appraised value fell further to S$77 mil. Keppel T&T first acquired a 50% interest in Citadel 100 in 2007. Subsequently, Securus Data Property Fund, a fund for data centres under Keppel purchase the remaining 50% stake in 2013. A large part is due to the quality of tenants, the length of the tenure of rental and the occupancy. 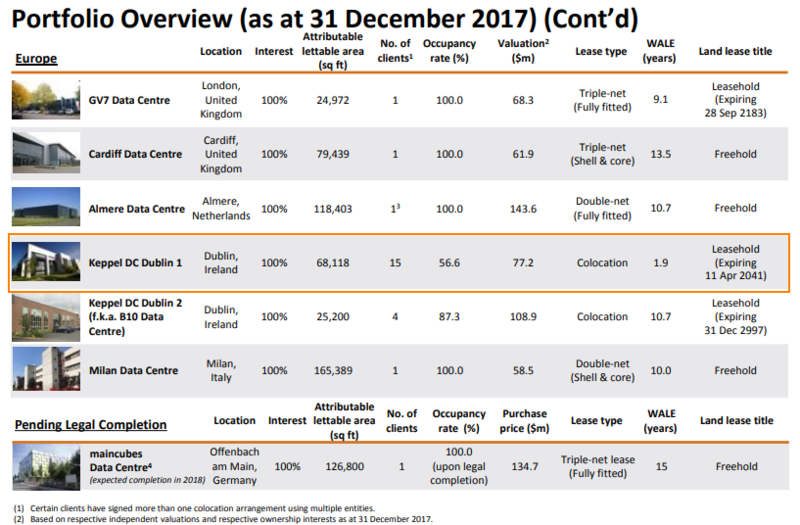 A large part of the value drop was due to the occupancy falling from 77% to 55%. Depreciation is not a straight line. It starts off with a gradual drop and accelerates rapidly as it approaches 0. I believe this property applies to all properties that have limited land lease, be it condominiums, industrial, commercial property. There is an added premium if the property is in a good location, have a long land lease, or freehold, that people are willing to pay. If there is perceived intrinsic value due to the location, land scarcity, then perhaps a large part of the property’s value will be made up of this premium. Keppel DC spent like 62% of its last appraised value to lengthen the land lease by $957 years. It kind of shows much of the current value is not in the occupancy and rental contract in my opinion. Land lease, the quality of cash flow of the rental lease are considerations in property value, which in turn affects the aggregate value of the REIT.